The Mudlarks were an unusual musical phenomenon in several ways. Unusually, the group were composed, at least for most of its lifetime, by real siblings- the children of the Mudd family from Luton in Bedforshire. Jeff, Fred and Mary are all alleged to have had jobs at the large Vauxhall motor plant which dominated the town. However, they spent their spare time singing together whenever the opportunity arose. They enjoyed singing the kind of pop tunes that were to become popular during the second half of the 1950s- not quite rock and roll, and not conventional ballads either. Their's was an up-beat novelty style and it attracted the attention of David Jacobs who had only recently established himself as a top disc jockey at the BBC. After an appearance on the the seminal "6-5 Special" TV show, a recording contract with Columbia quickly followed. The EP pictured here belongs to the only record that the Mudlarks had issued to come in a picture sleeve. It has become a significant collector's item. It was issued during the peak of their record making career and contains both of their biggest hits. The back of the sleeve contains a good set of notes with details of the group's early career. As well as describing their Variety debut, it explains how the Mudlarks were voted in a New Musical Express poll as Britain's top vocal group of 1958. 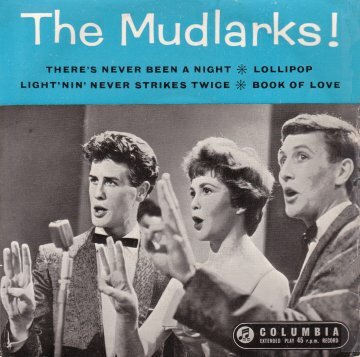 The Mudlarks' first release didn't sell well, but their second, the novelty "Lollipop" (a cover of a record by Americans, Ronald and Ruby), went almost to the top despite having another cover version from U.S. four-piece girl group, "The Chordettes" close behind. They chose another US number for their next release. Despite this being a doowop number, from the deeper voiced US group "The Monotones", they successfully transformed it into another novelty and again managed the top ten. Sadly, this was to be their last major hit on record although the group remained popular until well into the 1960s. Despite the fact that record buyers seem to have gradually lost their taste for the pop novelties that the Mudlarks were so good at producing, the group remain one of those that surely pioneered the emergence of a new UK grown sound.